After yesterday's long (for us) trip, a much easier one today; it's just a couple of hours from Tixall to Taft Wharf, so we had a relaxed start and set off at eight. 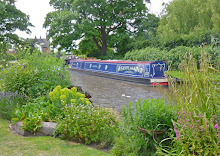 We could have left it later still, but queues can build up at Haywood and Colwich locks. The strategy worked well. Sheila did the big sweeping turn on the Wide and half an hour later we were locking down at Haywood. It was a pleasant chug to Taft, with traffic building up all the while. There was plenty of room when we got here at ten, just in time for a coffee before taking advantage of the dry weather to wash the starboard side. As we finished, we got into conversation with Colin and Jan on Polako who were engaged in similar titivating activity. It turned out that they know Graham and Carolann on Autumn Years and were planning to meet up shortly. Truly the cut is one extended village. After our morning exertions, we've been taking it a bit easier this afternoon. Peter and Jan on the other Sanity passed by; Peter had popped to see us last night at Tixall when they were moored at the far end of the wide from us. Regular readers (as they are, indeed) will recall that their Sanity is moored on Finch pontoon at Mercia, but we've known them since our own days on the Braidbar Sanity. Like I say, it's a village community. Later on, Stephen and Jayne on Dolce Far Niente went by, but we didn't get a chance to speak. Sheila's got some more crochet done and I caught up with IT stuff. Tomorrow, a late start again; it's about an hour to the Tesco mooring in Rugeley and we don't want to get there until some of the overnighters have had a chance to set off and make room.